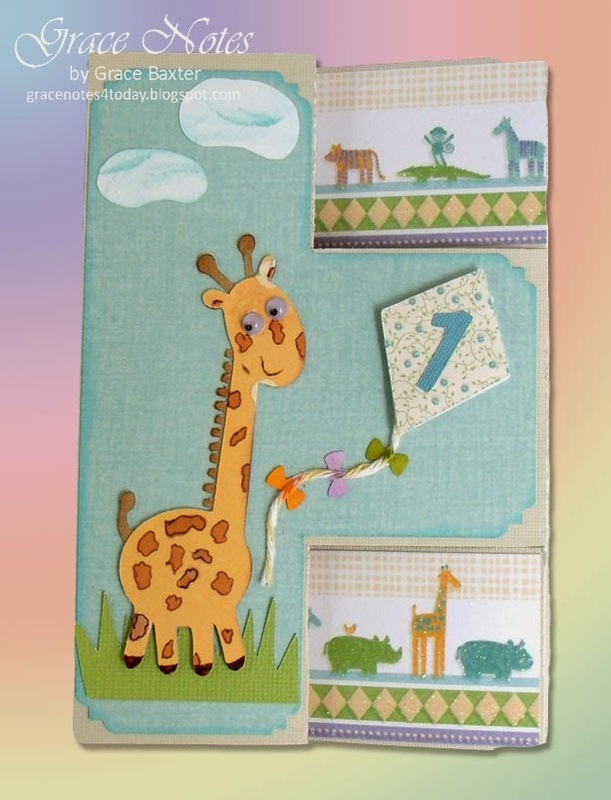 Who doesn't love a cute giraffe? For some reason, a toy giraffe is my little nephew's favourite toy. 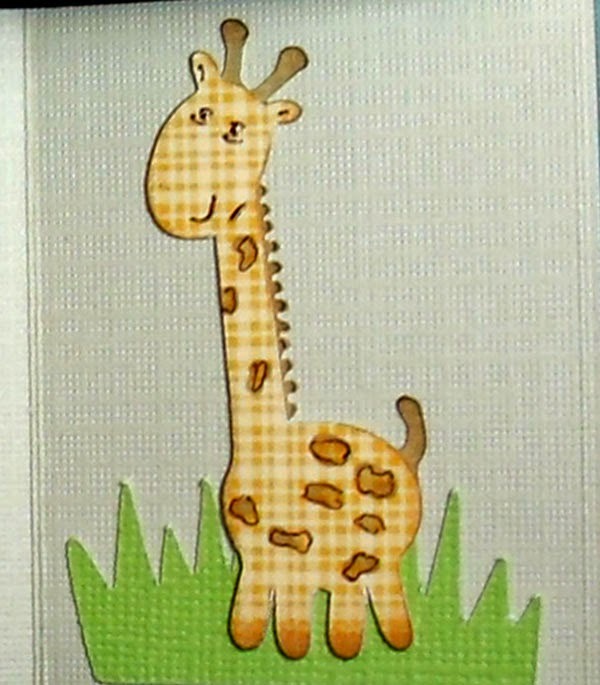 After checking out the various giraffe cuts, I think the cutest one is this little guy. 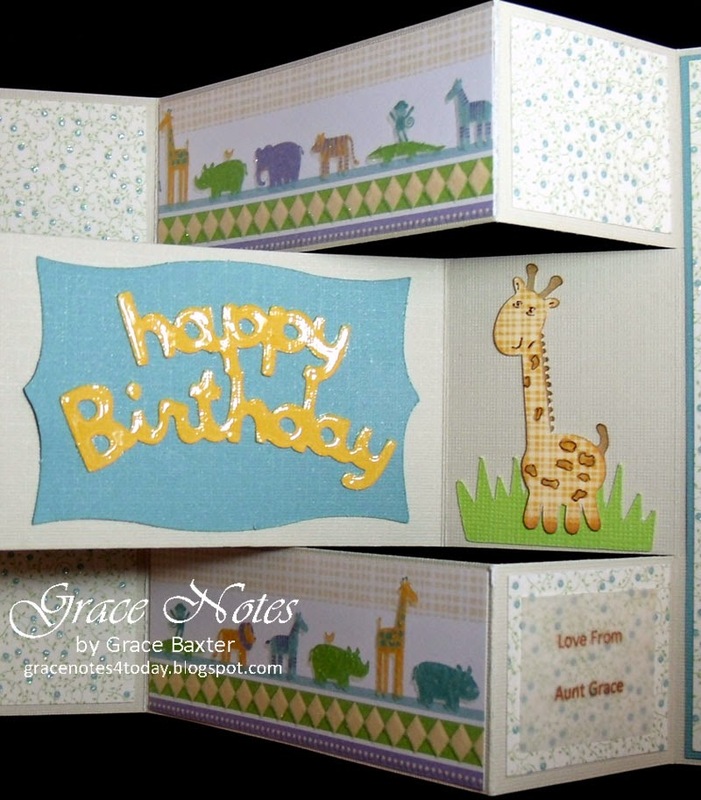 The shutter card opens to reveal a shiny "Happy Birthday" sentiment, and a baby giraffe. The sentiment is cut from bright yellow CS then thickened up with glossy accents. 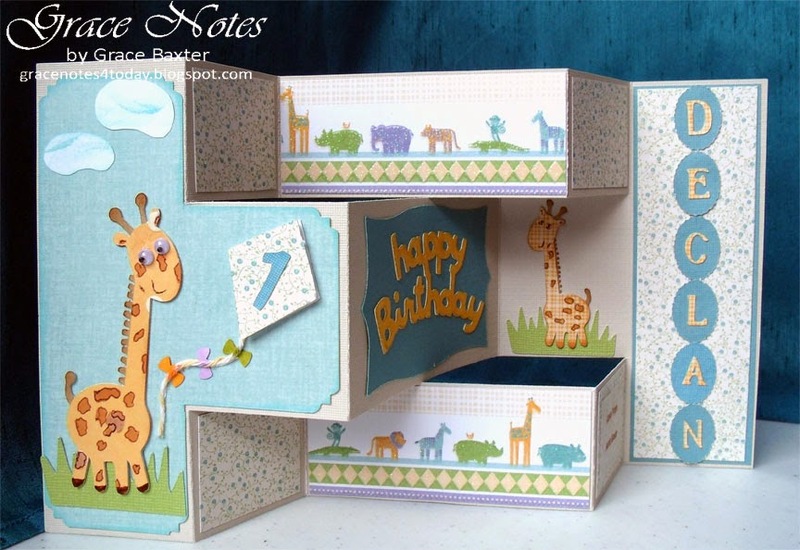 Print cardstock used is from Nana's Nursery, Baby Boy. I love the sparkly, embossed touches. Isn't this little guy the cutest ever? I love him being cut from yellow gingham to match the monogram letters. He's from the New Arrival cartridge. I painted all the spots and shading using my Pro markers. His mane, horns, tail and feet are shaded with Tea Dye ink. The kite is a combination of things. The right-hand panel needed something vertical to fill the space. 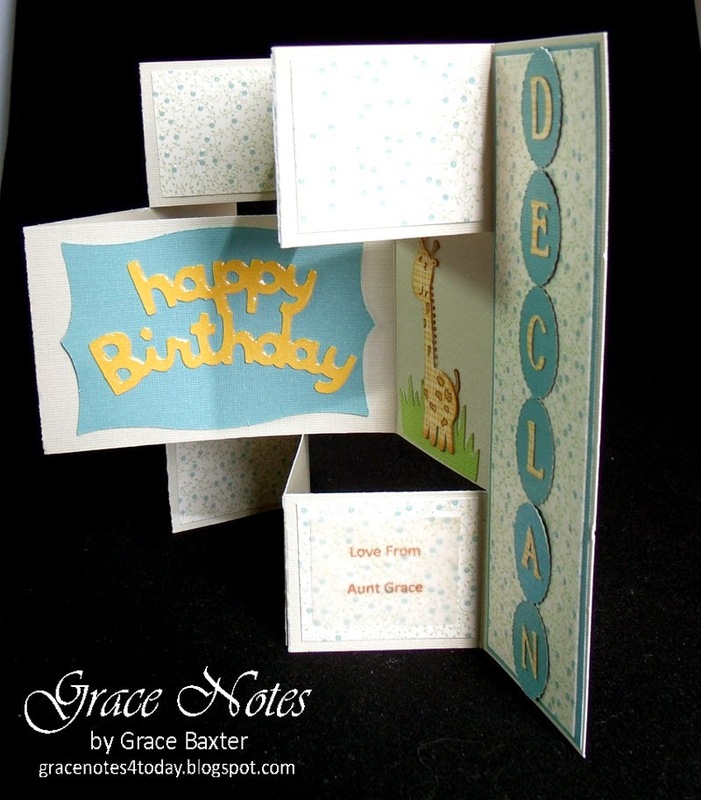 Making individual monogram medalions worked well for this and personalized the card. I took advantage of one of the squares to place my signature. For this, I created a small text box in Word and printed it on vellum. 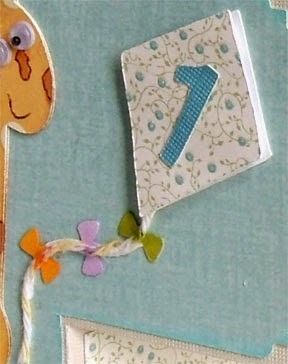 Cricut Craft Room Basics - number "1"
Here's one more pic of the finished card. That's adorable! 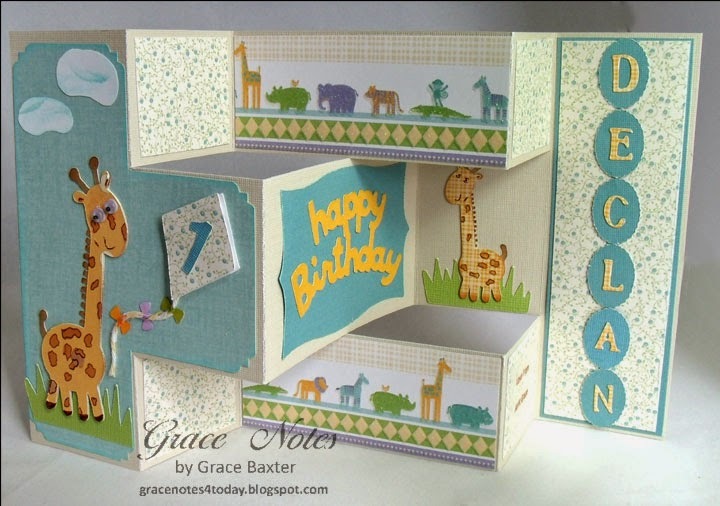 I love the Nana's Nursery paper; I used the Baby Boy stack for my grandson's scrapbook and the Baby Girl stack for his little sister's (who turns one next week). Your giraffes look great with the spots you colored. Thanks for sharing your precious card. You did a wonderful job! This card is so sweet! Perfect for a baby boy theme!